You can decide whether to operate by USB or Bluetooth. While USB is plugged in, KeyMouse Alpha will use the USB interface and charge the batteries. When you unplug the USB connection, the devices automatically switch to Bluetooth Wireless mode. You can change the function every key and button on KeyMouse Alpha (including the commands for scrolling up and scrolling down on the scroll wheel for both left/right hands). There are 6 key layers that can be saved into the devices. Our software is compiled and tested for Windows/Mac. We also have software for Ubuntu Linux (Beta). Due to the various flavors of Linux, sometimes Linux is less compatible for the software, but the devices should connect and operate fine. You just might need to connect to Windows or Mac to re-program the keys if the software isn't working for you. You can also connect wirelessly by Bluetooth to many Bluetooth enabled devices such as iPad, iPhone, and Android devices. Our key caps have white, blue, and yellow colors on them to show the various key layers (particularly for number pad and arrows). 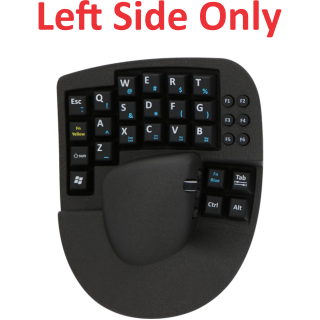 We want KeyMouse to fit your hands as closely as possible since it's important for your hands to be comfortable with all keys within reach when operating keyboard & mouse at the same time. Weight - One device (such as Right Hand only) weighs approx. 10.3 oz (292 g) without the battery and 11.5 oz (326 g) with the battery. 1. Does not have backlighting. 2. For size Small dimensions, click here. 3. For size Medium dimensions, click here. 4. For size Large dimensions, click here. 5. For size XLarge dimensions, click here.